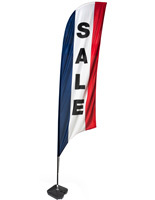 These "SALE" message feather flags have a 13' tall pole with a ground spike for placement in dirt and grass. 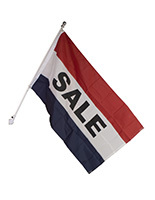 Each pennant has bold black lettering on red, white and blue stripes to stay noticeable in any crowd. The feather flags are made of polyester knot-blend to endure inclement weather. In addition, the banners with a ground spike feature a curving design that will not curl up in the wind. 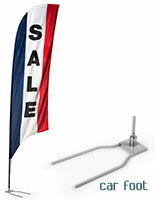 The flags with a curving pole are easily hammered into soil for convenient placement. The pennants with bold, black lettering are also available with a car foot, a cross base with a fillable bag or a hard plastic water-fill support.